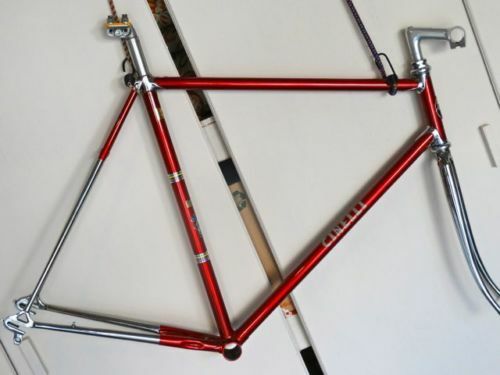 Classic Italian Steel Frame-Sets provides a continually changing inventory of refurbished '70s and '80s high-end vintage bike frame-sets from many renowned, respected Italian builders. There are also ones from brands about which you may not have heard. Additionally, the site offers information helping you build your bike for a comfortable, enjoyable ride. NOTE: For customers desiring cold-setting the rear stays to 130mm hub spacing for 8-, 9-, 10-, and 11-speed cassettes, the work may be done before shipment using a local master frame builder for a $60 additional charge. 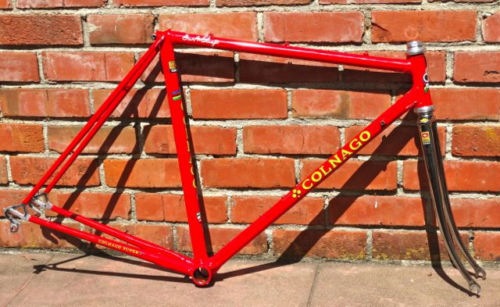 52cm (c-c) Colnago Super (53cm top tube) - Late 70's, Columbus SL, lugged construction. Nutted brake attachments, all-chrome, engraved, flat-crown fork, Colnago bottom bracket shell cut-out. 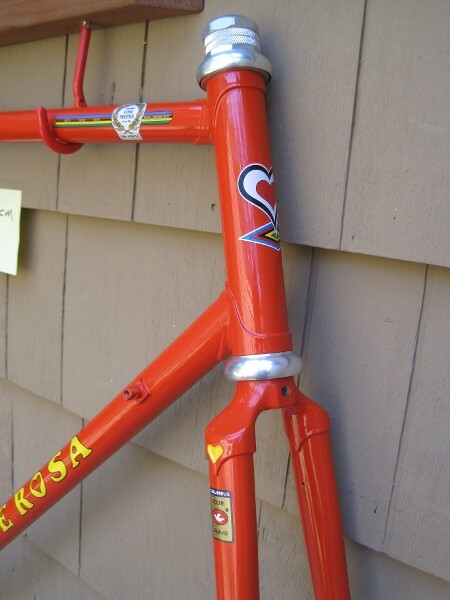 Professionally refinished in Italian racing red, re-plated original fork, reproduction decals. Campagnolo aluminum headset, bottle cage screws, seat binder bolt and drop-out adjusters. All threads fine. No corrosion or damage. Minor chrome loss on rear drop-outs from use. See photos. Unused since completed. Requires an Italian-threaded bottom bracket, widely available from various makers, 126mm rear hub spacing. Please ask questions I can answer, 98.6% Positive feedback eBay rating. As a cyclist for over 50 years and bike restorer for nearly 20, I derive satisfaction from returning "cosmetically challenged," artisan-made Italian steel frame sets to as-new appearance for cyclists to build and enjoy riding again. Frame refinish is far more durable than original. Some frames have been re-plated. In all cases chrome plating is very good to excellent and not pitted. Current inventory includes Italian, artisan-made steel frames in various sizes. More coming! International shipping charge based on location. 57cm (c-c) Cinelli SC frame-set (frame & fork) 56.5cm top tube. '60s Columbus lugged construction. Chrome fork, head and seat lugs and stays. Nutted brake attachments. Frame and fork professionally alignment checked, re-plated/refinished including reproduction decals. INCLUDES: Period-correct 26.2mm Campagnolo Record seat post and headset, Cinelli 1A stem, new Cinelli-specific seat binder bolt, head badge and drop-out adjusters. Unused since restoration. No dents or corrosion, all threads good. Requires Italian-threaded bottom bracket which are widely available. 126mm rear hub spacing. I acquired this frame last year. Braze-ons had been added to modernize it. It was stripped of chrome and poorly powder-coated. 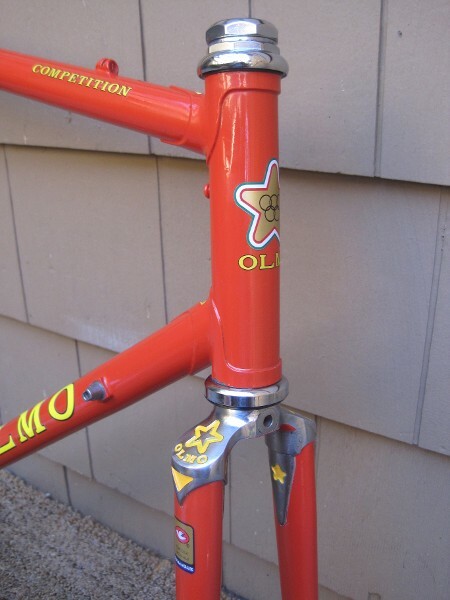 Restoration includes removing the non-original braze-ons, re-plating, refinishing, reproduction decals. The serial number was unreadable, even after media blasting. According to Cinelli experts I've asked, the presence of the bottom bracket plug screw see photo) dates it pre-1968. Please ask questions I can answer and see positive feedback from my frame-set customers. See current inventory under "See Other Items." 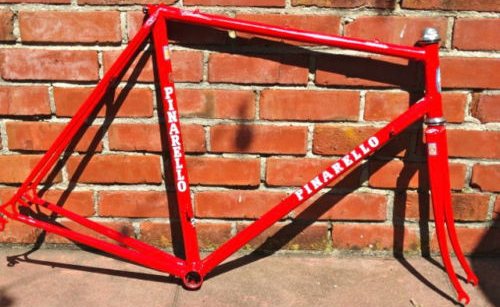 56cm (c-c) Pinarello Treviso (56cm top tube) 80's Columbus SL lugged construction. All normal braze-ons (see photos). Pinarello forged drop-outs, recessed brake attachments. Professionally finished with reproduction decals. Campagnolo Record headset, seat binder bolt, drop-out adjusters and bottle cage screws. Undamaged prior to refinish, unused since. No dents or corrosion, all threads good. Requires Italian-threaded 70mm bottom bracket which are widely available. 126mm rear hub spacing.